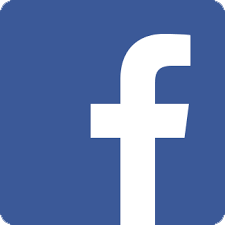 Follow CogniMenu on social media! 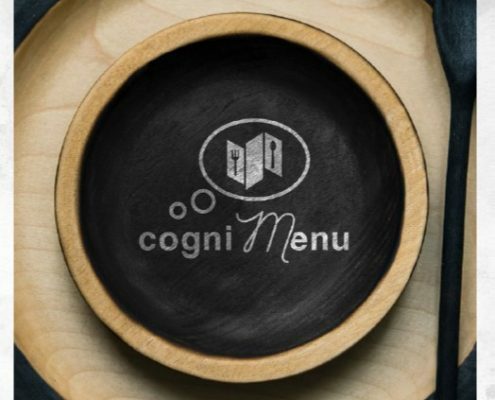 Cognimenu is a new generation menu engineering service providing you with support and tailored innovations to boost your restaurants’ sales. 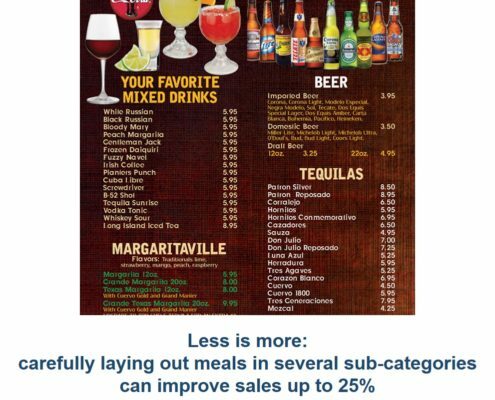 We reinvent and renovate your menu and display boards to explore hitherto unexploited opportunities and boost your sales. CONTACT US HERE FOR MORE INFORMATION!! ANALYTICA has been founded to make the power of behavioural sciences available to any business. With CogniMenu our goal is to adjust the layout, presentation and labelling of purchasing options to satisfy your clients’ expectations, improve their experience and most importantly increase your sales. 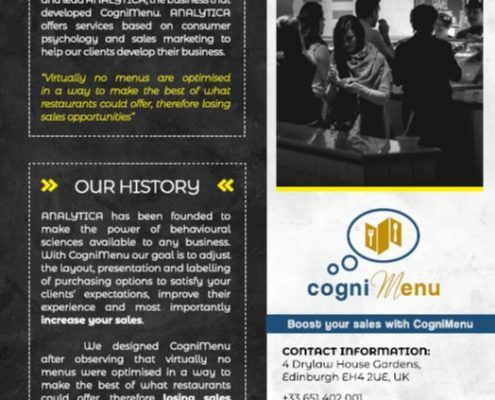 We designed CogniMenu after observing that virtually no menus were optimised in a way to make the best of what restaurants could offer, therefore losing sales opportunities. Optimising menus to boost sales through menu engineering is a common technique in some countries, like the US. In the UK though, there is not any innovative service like CogniMenu! At ANALYTICA, we have more than 10 years of experience in the use of behavioural sciences and psychology applied to sales marketing. Our values are based on reliability, safety, efficiency and excellence. ANALYTICA is a member of SUXECO, a network of reliable companies, whose members share the values of loyalty, respect and honesty throughout the delivery of their services. So as to always provide you with a high standard of services that satisfy your expectations, ANALYTICA has built a network of high-quality partners including communication agencies, business management companies, and digital marketing and web-marketing agencies. ANALYZE YOUR MENU FOR FREE! 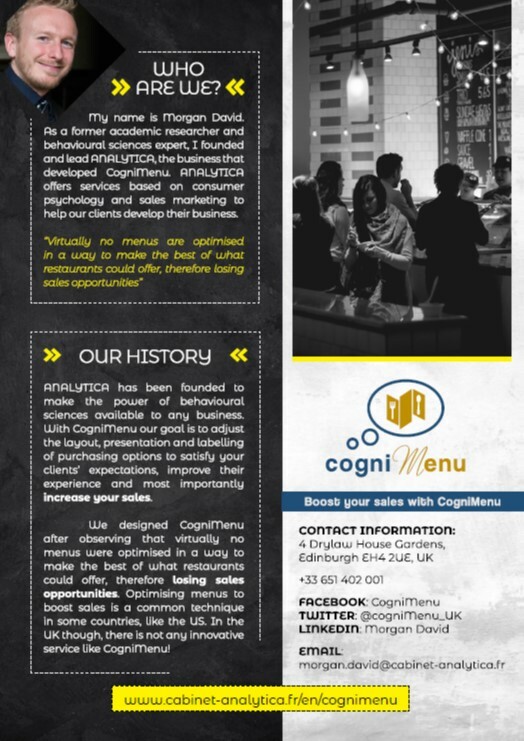 CogniMenu offers you a FREE analysis of how efficient your menu or your display boards are at generating sales. Want to take advantage of it? It is very easy! 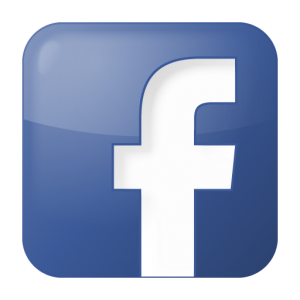 You just need to send us a photo or a pdf file of your menu or display boards. We then run a detailed analysis based on 33 criteria. 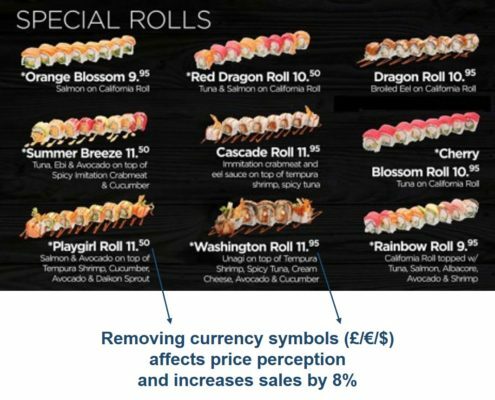 The results of the analysis are eventually sent to you and show a global score, 4 other scores reflecting price optimisation, neuromarketing, structure and customer experience. 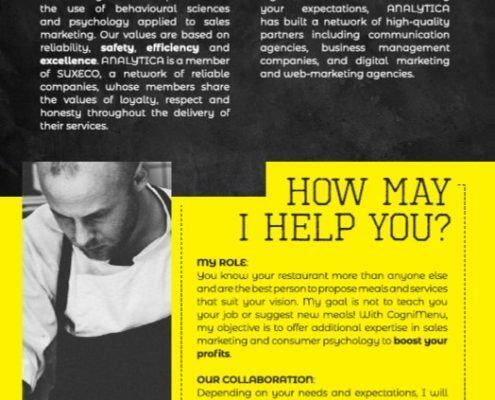 We also provide a list of your menu’s strengths as well as insights for improvement. To know more about the free analysis and send us your menu, please visit the dedicated page here, or click on the link below! Maximising your potential and boost your sales. 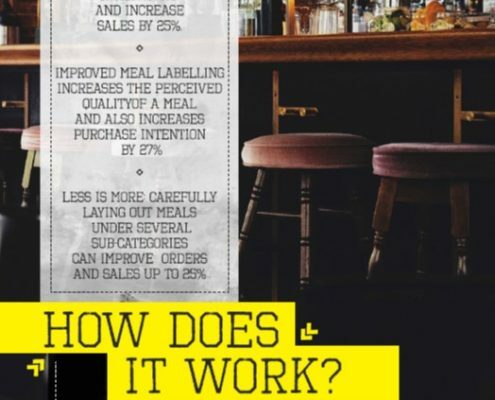 We reinvent the structure, organisation and presentation of your menu, as well as the labelling and pricing of meals. 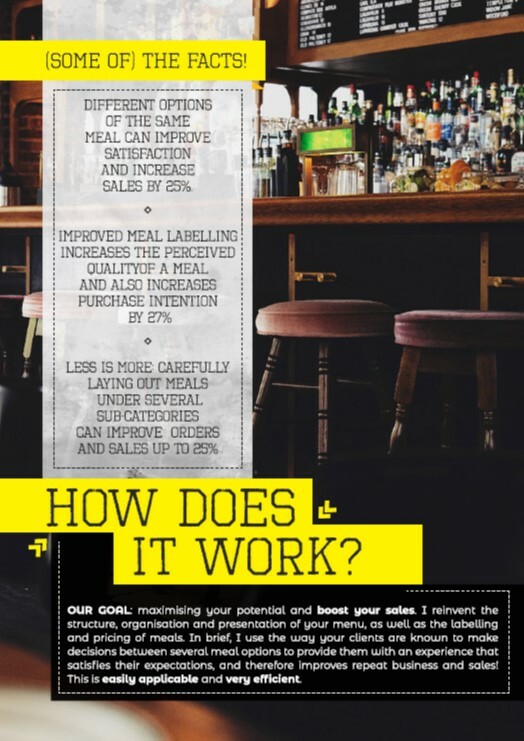 In brief, we use the way your clients are known to make decisions between several meal options to provide them with an experience that satisfies their expectations, and therefore improves repeat business and sales! This is easily applicable and very efficient. You know your restaurant more than anyone else and are the best person to propose meals and services that suit your vision. 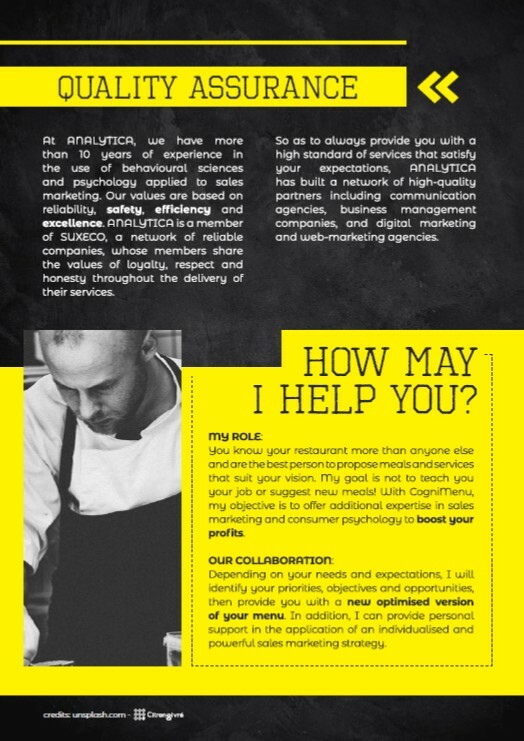 Our goal is not to teach you your job or suggest new meals! 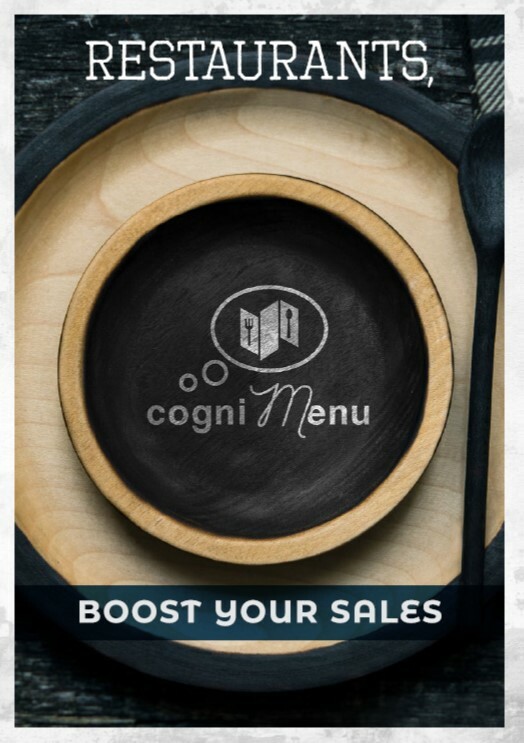 With CogniMenu, our objective is to offer additional expertise in sales marketing, menu engineering and consumer psychology to boost your profits. Depending on your needs and expectations, we will identify your priorities, objectives and opportunities, then provide you with a new optimised version of your menu. In addition, we can provide personal support in the application of an individualised and powerful sales marketing strategy. 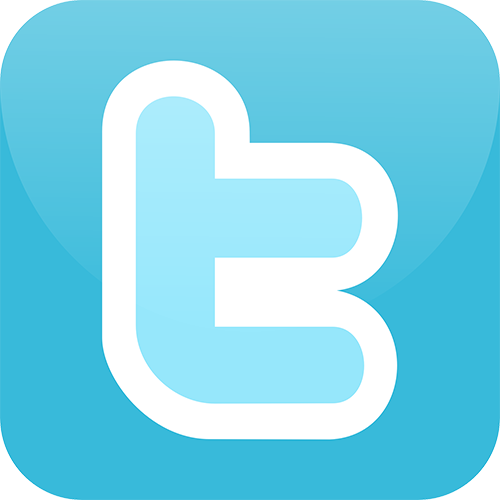 We are available anywhere in the UK and beyond!